The B-Folders secure organizer will not only allow you to migrate all data from your Palm PDA/Desktop, but will also upgrade your configuration with tight security measures and allow you to use it on today’s smartphones, tablets, laptops, and desktops. A lot of Palm users, desperate to save years of data saved on the Palm operating system, are trying unsuccessfully to sync different pieces of software (Outlook, Google contacts/tasks, and variety of Android apps), encountering endless and unsolvable compatibility issues. History certainly demonstrates that syncing data between different software programs never works flawlessly. 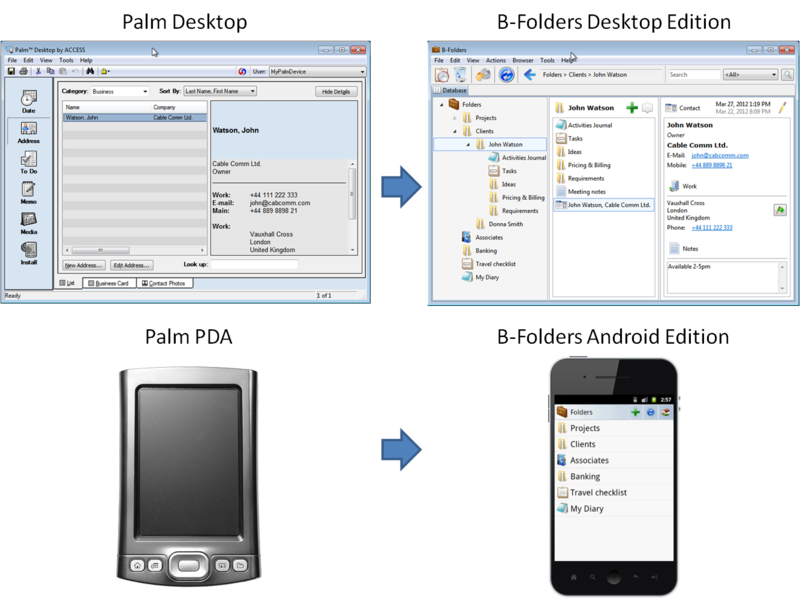 The most important aspect of moving to the B-Folders organizer is that transfer of data from Palm is not difficult. Step-by-step instructions are provided on the Help Center, and the transfer is clean and accurate, retaining categories and often even specific fields.